Exchange rate fluctuates based on currency market. In the last 4 years the COP has fluctuated in a range of 1600-2500 per US dollar. It is a good idea to check the rate before you come as the rate can change quite a bit in a short period of time. 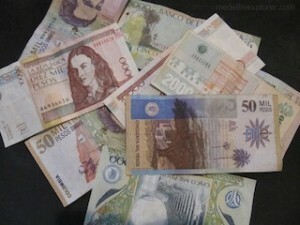 US dollars are not generally accepted to purchase good or services in Medellin. With very few exceptions you will not be able to spend US dollars. You will need to convert your money to COP. These are basically money exchange stores. Some have better rates than others but most are pretty close. Sometimes the exchange rate is greater than the bank rate, sometimes less. This depends on market conditions. They are located all over the city. Some are freestanding, and virtually all the malls have at least one and many have several. There are 2 in the airport, so you can change as soon as you arrive if you wish. But be sure to use the one upstairs, as the downstairs one is a ripoff. To change over $1000 most will require you to have your passport with you and will take a fingerprint. Depending on the bank associated with the ATM withdrawals are limited to a daily maximum. Generally get the bank exchange rate minus any fee’s charged by the institutions sponsoring the card and the ATM. ATMs strictly limit withdrawals on foreign and domestic cards. There are 5 major international banks with local offices, if by chance you hold a card of any of these banks your rates are usually lower (Citibank, HSBC, RBS, Santander and BBVA). The largest Colombian bank is Bancolombia with ATM’s everywhere. Use precautions and common sense as some ATM’s are located in areas that are not as safe as others. When withdrawing money from an ATM it is advisable to avoid any located on streets for safety purposes. It is recommended to withdraw from ATMs inside shopping centers or banks. Where, how, cost, and quantity of cash these can be used to get depends on the card. Major credit cards are accepted for payment at many restaurants, stores and hotels. Like many large cities, Medellin has its fair share of banking institutions. Most banks do not employ bilingual employees who speak English. Many have large ATM networks, small branch offices in malls and shopping centers and some offer money exchange services. Few, if any, of the National banks will allow a foreigner to open a bank account or make it very difficult to do so. To open a bank account in Colombia, you must either have a cedula (which you receive after obtaining legal residency) or otherwise be able to prove to the bank that you have been living in Colombia for six months (hard to do without a cedula).